Over the years I have had the pleasure of designing several banners that were given out for free to fans at K-Pop concerts held in Australia. These projects were the culmination of several months of planning, fundraising and design and represent the hard work of a lot of people. We sought permission from the Promoters as well as the Agencies involved to use the images and logos on the basis that the banners were not for profit or sale. I would like to make it clear that I do not give permission for the resale of any banner that I have designed, or the commercial use of the artwork that I have created. I retain the copyright to any relevant designs and layout and acknowledge that these are derivative works and I have no ownership of the images or logos used. Although I cannot stop people from attempting to sell them, it’s disrespectful and against the spirit of fan projects. However, I am very happy for you to print your own personal copy to display on your shrine / wall / ceiling etc. It makes me happy to know that people like them! Kicking off my Boys Over Flowers re-watch-athon-2K15 is the Japanese version first aired on TBS from October to December way back in 2005! I first watched this online, in extremely low quality, in 10 minute chunks uphill both ways in the snow! I fell immediately in love with the offbeat, quirky humour of the series – the characters are slightly exaggerated and comic-like 4D people, but there’s still drama and pathos to be had. The main cast has great chemistry (to this day delulu shippers insist that the wedding is JUST around the corner… In a deep corner of my heart I totally join them in hoping for this) and the series does a fab job of condensing the rather extensive source material down. Series 1 covers 9 jam-packed episodes of plot, so get this re-watch party started I have provided a brief character primer below before we jump off the cliff that is this crack-filled delight. Needless to say there are some light spoilerssssssss ahead! There’s nothing quite like setting oneself an epic challenge – and if it involves a ridiculous amount of time watching cute (though at times hateful) boys and the most trope-filled RIDICULOUS plotline to ever be committed to film (in no less than 4 different adaptations) I’m up to the task! After the ‘Jackpot’ promotions were cut short (due to the Sewol Ferry disaster) It was great to see Block B back with a follow-up mini album a short while later. The promos promised something fun, slightly off-kilter and most of all… very VERY pink! Block B are a group whose MVs I always enjoy, as they’re usually a bit deranged with a hefty side of tongue-in-cheek winking at the camera – this is not a group who are afraid to destroy their idol image on camera at all. Their last two promo cycles were ‘Very Good’ – bank robbing themed mayhem, and ‘Jackpot’ – circus themed mayhem. So in keeping with this tradition, ‘H.E.R’ is appropriately full of riotous pop colour, excessive and exaggerated aegyo, and a fun time is had by all. Thankfully ‘H.E.R’ throws the cute out the window (sort of) and embraces the silly, over the top joy that the feeling of being in love brings. It’s literally a cute concept on crack, or addled with caffeine and ADD… But it still manages to poke fun at the usual tropes of cute kpop while having a lot of fun romping around. The song has a really bright and upbeat tempo and like a lot of KPop this year, is somewhat of an homage to music styles from the past. This has a brassy 60’s pop feel, and the over saturated candy colours in the MV reinforce that connection. It’s catchy and fun and still has the distinctive Block B feel. Zico has done a really great job producing a cohesive body of work that captures their personalities and showcases their talents. The live stages were a heap of fun as well, and best of all, we were treated to a few performances of ‘Jackpot’ as well. This GIF is a few scenes spliced together! But I laughed so much at the set-up and then the payoff for this. So the chorus is very catchy! I especially like the kaleidescope effect where the basketball hoop shots are all smushed together. This is so incredibly strange and dada-esque that it delights me – Zico also has a rather expressive face and makes some great GIF moments here. So cute! Also rather clever as I remember seeing these all around the super market when we were in Korea. P.O’s noona-slayer pink (bright pink!) hair is also a highlight. So sweet! And another echo of the kaleidescope imagery in the set and the pop-art sequences. Hands down, the best part of the whole MV. My bias!!! But really, this is too funny. The show within a show is a great conceit as well. 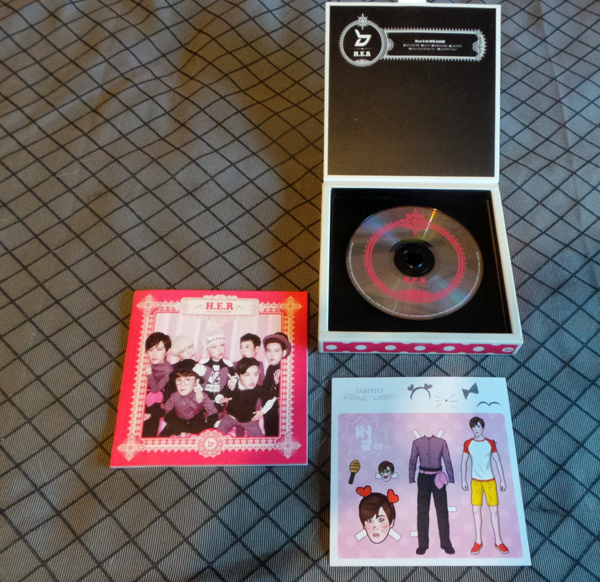 In a sea of black and subdued albums ‘H.E.R’ and its bright candy pink packaging definitely stands out from the crowd! 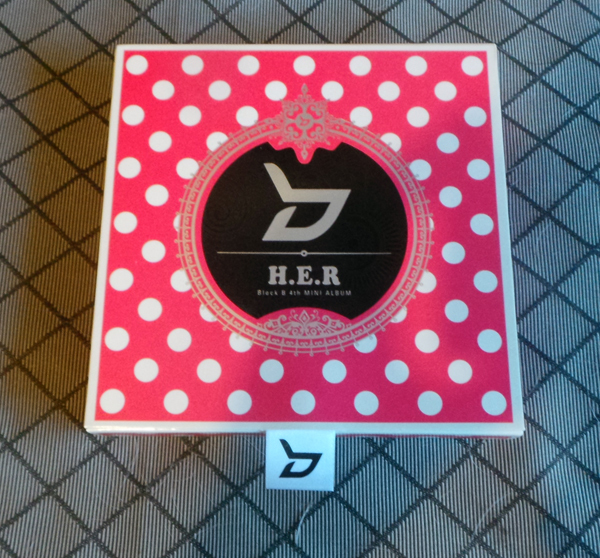 Unlike other groups, there is no consistency to sizing or styling with any of Block B’s previous releases. Each album is distinct from the last – which makes for an interesting and eclectic shelf arrangement. ‘H.E.R’ is a 15 x 15 box enclosure (yay boxes!) constructed from a matt laminated card that is screen printed, foiled and spot uv highlighted. Interestingly it’s an interlocking die-cut rather than a cut and glue. (The print and design part of me likes to see how these albums are made, it’s a big part of the reason that I buy a physical copy, because they use so many interesting design techniques). This is a cheaper method, but the corner mitres are snug and the inner flap has an additional layer glued to it to add weight and improve the finish. I like the paisley design that is subtly printed on the black too! It’s a super feminine touch to an already overwhelmingly pink album. The cover is also a magnetic closure with a ribbon pull tab that is printed with their logo. Rather than including a photocard, you instead got a random ‘paper doll’ of a member enclosed. 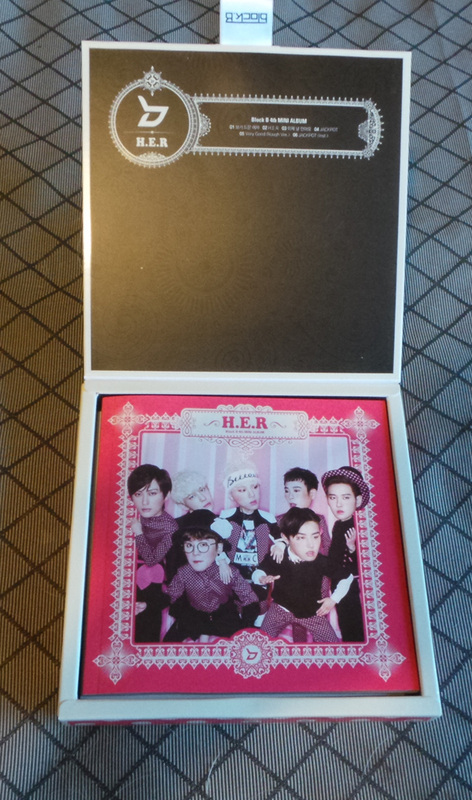 I got Jaehyo! It’s a wonderfully kitsch inclusion that makes me love the album that much more. The photobook is also a lot of fun, featuring bobble-headed shots of the members posing with props. It’s totally cute – in a kind of exaggerated hyper-adorable way – it’s almost like they’re dolls with their tinted pink cheeks and toy scale props. I’m quite tempted by the Special Edition as well which includes a DVD and extra photoshoot with a larger photobook, but it may have to wait until I am more financially solvent! there are too many albums to buy this year! The mini album has 6 tracks in total that are a kind of grab bag of styles and sound. I enjoyed the rough version of ‘Very Good’ and the ballad ‘Embrace Me Now’. This was a great comeback and it was fantastic to see them get a few more wins under their belt too! And bonus dance practice in super cute onesies!! All dance practices should be this adorable! Joining an official K-Pop fanclub might seem like an odd thing to do as an International based fan – particularly as most of the benefits of being a member only apply to events and concerts that are held in Korea – but it’s another way to support a group while getting a nifty card with your name on it that you can flash to prove you’re a literal die-hard card-carrying member! K-Pop groups usually have specific sign-up periods for their official fanclubs (generally a 2 week window of time) once a year (and sometimes not even that!! SHINee open your registration again already!!). Depending on the group, sign-ups may be via the official Daum cafe, an email address, via the record company website, or through a third party website. It used to be very difficult for a fan not based in Korea to join, as you’d often need a Korean postal address, or even a Korean SSN (Social Security Number) and the whole process was in Korean (as you’d expect) But these days, recognising that the Hallyu wave has brought the world to their door, more and more groups are adding an ‘International Fan’ option. Instant level-up in the Daum fancafe so that you have earlier access to behind the scenes photos, messages from members etc. This is really great for me, because I’m a total lurker when it comes to the fancafes, as my Korean fluency is still pretty sketchy and I slightly hyperventilate at the thought of having to write a post in order to accumulate participation points. Some groups don’t extend all of these benefits to international fans, so if you’re joining to have access to a fansign/fanmeeting for when you’re in Korea, be sure to read the fine print! And these benefits only apply to concerts and events held in Korea during the year that your membership is valid; if your group comes to your country, being a member will not give you early access to tickets. To take advantage of the benefits while in Korea, you’ll need to be able to navigate the fan cafe & understand some Korean to find out dates, times and the application process for fanmeetings, or be a whizz with google translate (or be like me and stalk Tumblr tags for helpful people who write tutorials on how to do things!) And even then, nothing is guaranteed! So far this year, I have joined the following fanclubs: The costs are in Australian dollars and each membership works out to about $60-80 once shipping is factored in. Most of these were super easy to sign up for, as the third party website that they used (Interpark) had an option in English and accepted foreign credit cards. The hardest part is joining the fancafe and applying for your level up LOL! Infinite had their 4th fanclub recruitment for Inspirits earlier this year. It was all handled through Interpark, who also helpfully added shipping costs automatically, so required no effort whatsoever! 2 months after the sign-up I received a package via DHL. It was a pretty hefty box and I was surprised as during sign-up the ‘fan goods’ weren’t actually listed – we just knew it would be something. Much to my joy, it was the new lightstick of GIANTNESS! 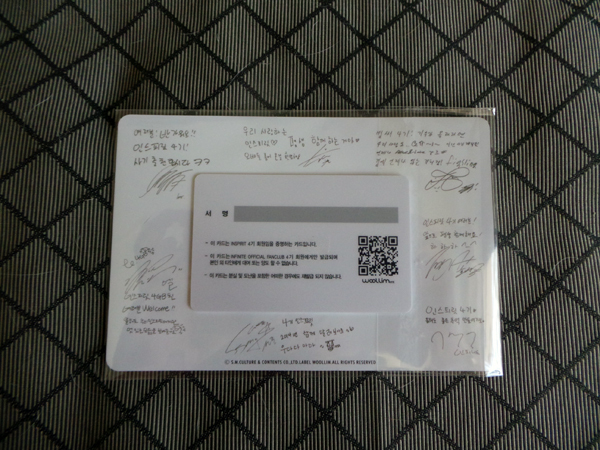 We also got our card as well as a postcard with printed signatures and messages. 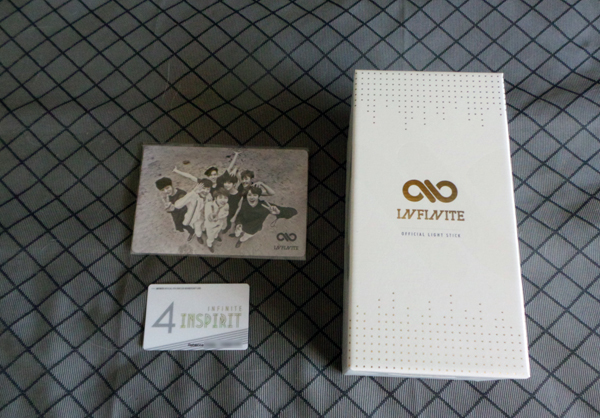 It was all super cute, but I was mostly excited about the lightstick. Buying one of these and paying shipping costs more than the fanclub membership itself, so this was a win for me! The lightstick is really pretty – and has a cut-out on the top in the shape of the logo, so when it lights up it casts the same shape – so clever! 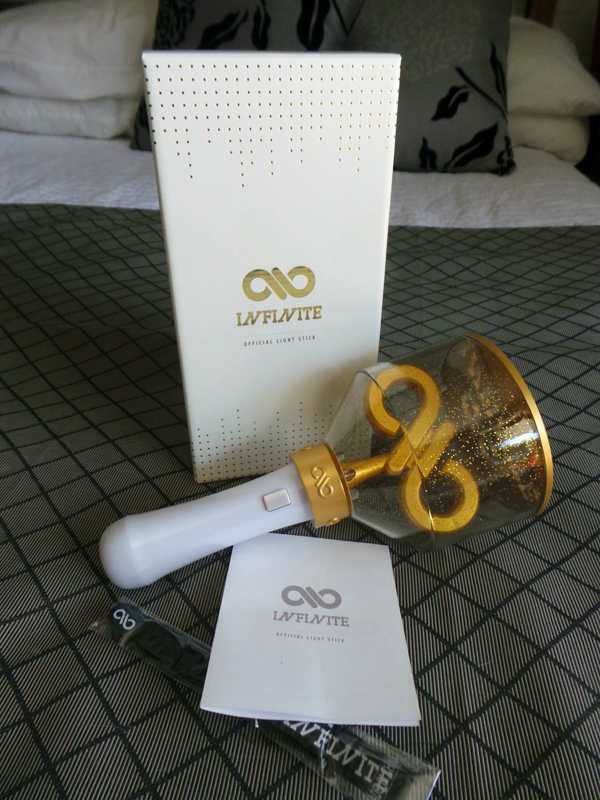 So now I’m armed with an official lightstick for the next Infinite concert that we go to! 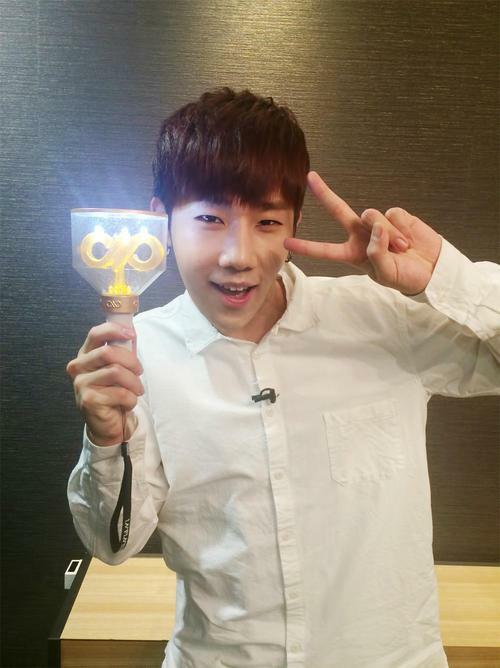 Special bonus – my ultimate bias Sunggyu posing (as only he can) with this glorious piece of merch!